Secretary of the National Environment Commission (NEC) of Bhutan, Dasho Ugyen Tshewang, visited the International Centre for Integrated Mountain Development (ICIMOD) headquarters on 1 April 2015 to discuss ways to strengthen collaboration between NEC and ICIMOD. The Atmosphere Initiative of ICIMOD is working with NEC to set up climate observatories and air quality stations in several locations in Bhutan. Dr Arnico Panday, Coordinator for Atmosphere Initiative at ICIMOD, gave an overview of the initiative and its activities in Bhutan. Detailed discussions were held about progress on the observatory in Gedu, the air quality station in Thimphu as well as future sites. A guided tour of the instruments purchased by ICIMOD for installation at Gedu was also organized for Dasho Tshewang. 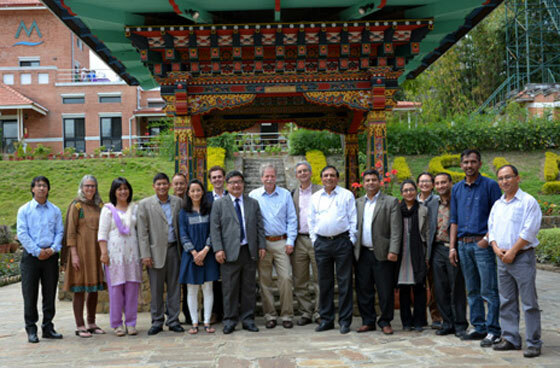 Prior to his visit to the ICIMOD headquarters, he had visited Ichhyakamana, the site in Nepal for a twin observatory to Gedu. Dasho Tshewang said that he found the activities and plans of the initiative very inspiring and was impressed with the expertise of the team members. He congratulated the team on their success so far and thanked the initiative for the activities in Bhutan.